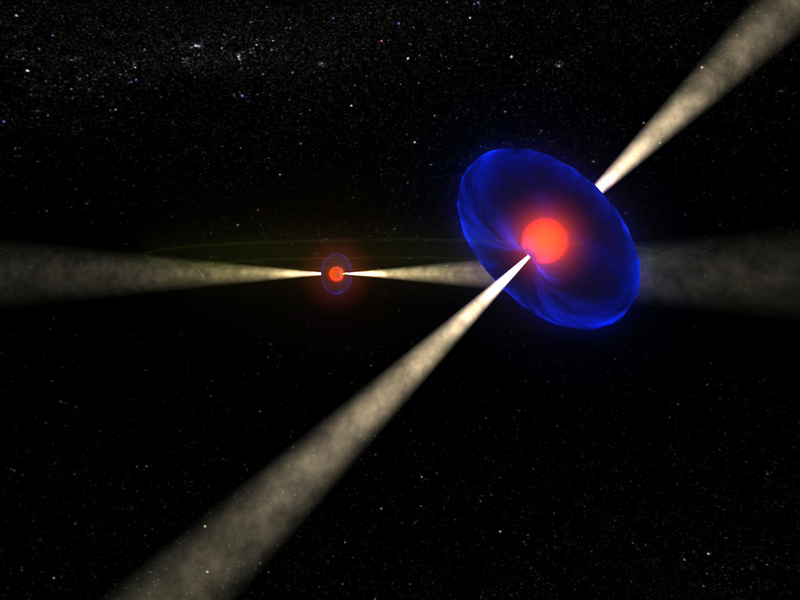 E-mail: "r.breton" + "@" + "soton.ac.uk"
The double pulsar PSR J0737-3039A/B is the only known pulsar-pulsar system, that is, two neutron stars orbiting each other and both visible as radio pulsars. 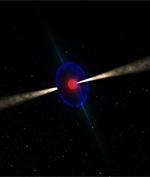 The first pulsar, PSR J0737-3039A, was found by Burgay et al. (2003) while the second one, PSR J0737-3039B, was found by Lyne et al. (2004). Several papers involving different aspects of the double pulsar have been published in the litterature. Click here for a list. We recently studied a unique eclipse phenomenon in the double pulsar which allowed us to measure the relativistic spin precession of PSR J0737-3039B to high statistical significance. The spin precession rate that we measure is in agreement with Einstein's theory of general relativity. This work appeared in the July 4, 2008, edition of Science Magazine. Please follow this link to reach the article. - Press release from McGill University [online English version / pdf English version / online French version / pdf French version]. - Press release from the National Science Foundation. - Press release from the University of Manchester. - Press release from the National Radio Astronomy Observatory. - Online article in ScienceNow. - Online article in Daily Telegraph. - Online article in New Scientist. - Online article in Science Daily. - Online article in Science Centric. - Online article/comments on Slashdot. - Online article in e! Science News. - Online article by AFP. - Online article in The Telegraph. - Online article in Cyberpresse (French). - Online article in RIA Novosti (in Russian). - Online article in Welt der Physik (in German). - Online article in Pro-Physik (in German). - Newspaper article in Le Devoir (in French). - TV interview RDI en direct / Matin (and also here). Aired on July 4, 7:30 am, across Canada (in French). - TV interview Le téléjournal de Radio-Canada. Aired on July 4, 10-11 pm, across Canada (in French). - TV interview Global News (Quebec). Aired on July 4, 6-7 pm. - Radio report Les Années-Lumières, Première Chaìne de Radio-Canada. Aired on July 6, 12:15-3 pm, across Canada (in French). - Newspaper article in USA Today. - Online article in Discover Magazine. - Online article in Victoria Times Colonist. - Online article in The Times of India. - Online article in The Nation. - Online article in Zee News. - Online article in Express India. - Online article in France 24. - Online article in The Straits Times. - Online article in ABS-CBN News Online. - Online article in Parkes Champion-Post. - Online article in The Herald-Dispatch. - Online article in Lenta (in Russian). - Online article in Gazeta (in Russian). Below are videos illustrating our research that you can download. 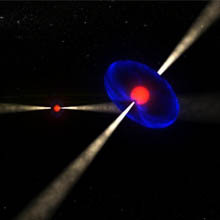 The eclipses in the double pulsar PSR J0737-3039A/B occur when pulsar A's projected orbital motion, represented by a gray circle moving on a black line, passes behind its companion, pulsar B. 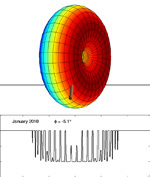 Radio emission from pulsar A is absorbed via synchrotron resonance with the plasma trapped in the closed field lines of the truncated dipolar magnetosphere of pulsar B, shown as a colored dipolar structure. Since pulsar B's magnetic dipole axis is misaligned with respect to its spin axis (represented by a diagonal rod), the optical depth along our sight line to pulsar A varies as a function of pulsar B's spin phase. The theoretical light curve resulting from the eclipse animated in the upper panel is drawn as a black curve in the bottom panel and real eclipse data, observed with the Green Bank Telescope in April 2007 are overlaid in red. The animation speed corresponds to real time and the audio track is the sound that one would hear if the radio signal detected from pulsar A by the radio telescope was noise-filtered and amplified into an audio device. While individual pulsations from pulsar A are too fast to be distinguished, we can hear a mixture of F musical tones harmonically related to 44 Hz (F1 tone), the spin frequency of the pulsar, which is modulated in intensity as a result of the eclipse. Time-lapse animation displaying the evolution of pulsar B's geometry in the double pulsar PSR J0737-3039A/B due to relativistic spin precession between January 2004 and January 2029. The truncated dipolar magnetosphere of pulsar B, shown as a colored dipolar structure, rotates about its spin axis, pictured as a diagonal rod. The apparent orbital motion of pulsar A during the eclipse corresponds to the horizontal black line intersecting pulsar B's magnetosphere. 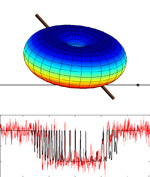 Relativistic spin precession is similar to the wobbling of a spinning top and induces a motion of the spin-axis orientation around the orbital angular momentum, which is vertical in this movie. The theoretical light curve corresponding to the eclipse animated in the upper panel is drawn in the lower panel. The angle phi corresponds to the longitude of the spin axis, with 0 degree being the direction coincident with the line of sight. This audio file is the sound that one would hear if the radio signal detected from PSR J0737-3039A by the radio telescope was noise-filtered and amplified into an audio device. While individual pulsations from the pulsar are too fast to be distinguished, we can hear a mixture of F musical tones harmonically related to 44 Hz (F1 tone), the spin frequency of the pulsar. The sound is modulated in intensity as a result of the eclipse when the pulsar passes behind its companion pulsar. Observations were done at the National Radio Astronomy Observatory with the Robert C. Byrd 100-meter radiotelescope in Green Bank, West Virginia. The National Radio Astronomy Observatory is a facility of the National Science Foundation operated under cooperative agreement by Associated Universities, Inc.